Why Do We Need To Convert Word To PDF? We know that Word and PDF are popular forms of electronic document files, and both have some exceptional qualities that compel the users to accept them as a part of their daily activity.The need of converting Word to PDF is a common issue for majority of the users. PDF is known for its security feature and compatibly with the different platforms, including the mobile OS. On the other hand, Word is known for its greater flexibility that allows the user to customize the document, and edit them, as per the need of time. However, when we speak about the aesthetic value, the name of PDF comes immediately into our minds. PDF files are fairly compatible with various platforms, including the mobile OS. It is not just this, as they are free from any malware attack, and compact-sized, the quality which makes them easy to be attached and uploaded. Thus, there are some recognizable advantages that make them one of the most popular ways of presenting the document. The easiest way to access the DocSmartz Word to PDF converter is to look at the Add-Ins on the Word file and click on the 'Create PDF' icon. Step 1: At the very first interaction with the software, you will be asked to select the location where you want to save the converted file. Step 2: It takes just a few seconds to convert a Word file to PDF when you click on the 'Create' button. 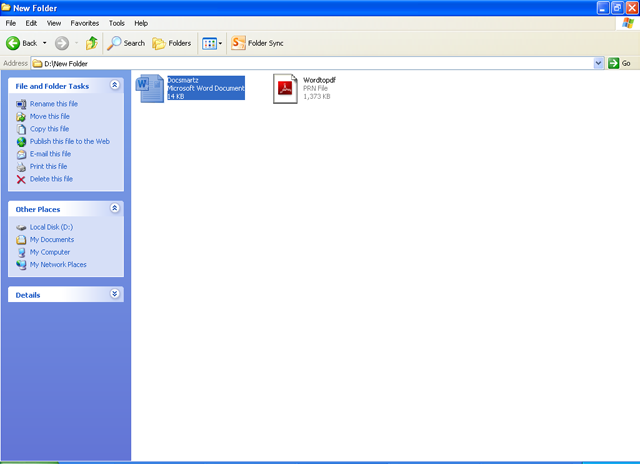 In-built Adobe Reader allows you to view the document, instantantly. 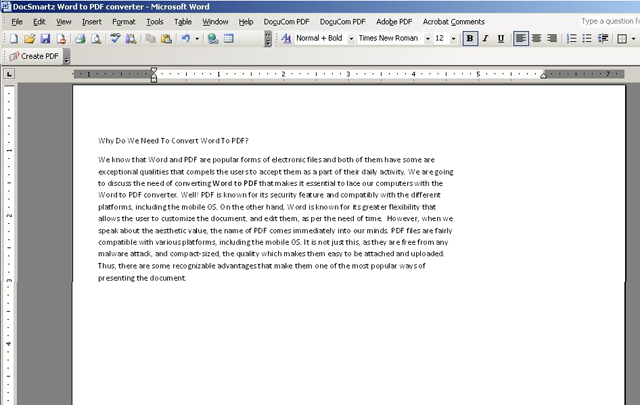 Thus, it is not difficult to answer that how to convert Word to PDF by using the PDF creator. If, the word file is not open, you can simply select the document and right-click the mouse. 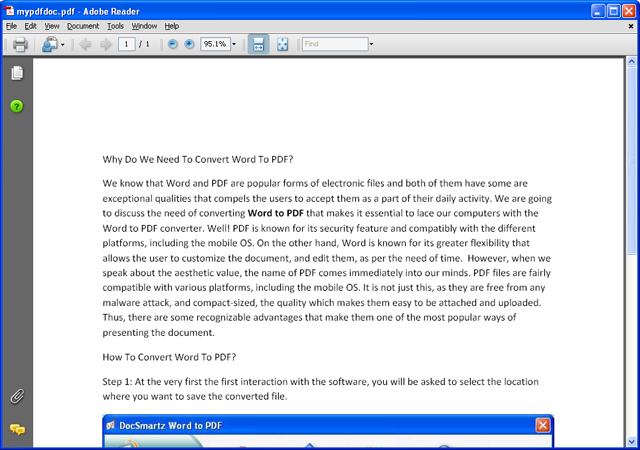 Now you need to click on 'Convert Using PDF Creator', and your document will get automatically converted from Word to PDF. It is for sure, that when you create PDF, it does not lose any of the visual looks while conversion. Thus, you will be assured of the fact that you are not going to miss any formatting, layout, font, bookmark, hyperlink, table, image, graphics or any such thing that you will prefer to be present on the converted document. Therefore, using this specialized software for converting a Word file into PDF is quite advantageous, as it's time-saving and performs the necessary action in the perfect way.